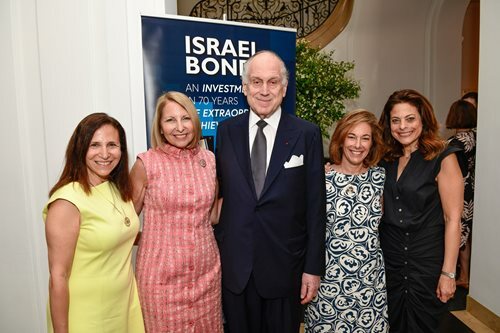 In a two-day conference held by Israel Bonds’ Women’s Division Prime Minister’s Circle, over 50 women from around the U.S. and Canada gathered in New York to hear from international philanthropist, diplomat and entrepreneur Ronald S. Lauder, marked by a reception and exclusive guided tour of the Neue Galerie museum of which he serves as president. Lauder, chairman of Clinique Laboratories, LLC, a division of the Estée Lauder Companies, Inc., is the son of the late Estée and Joseph Lauder, founders of The Estée Lauder Companies Inc., and currently serves as President of the World Jewish Congress, meeting with global dignitaries and religious leaders as he represents Jewish communities in over 100 countries around the world. In meeting art dealer and museum exhibition organizer Serge Sabarsky over 50 years ago, the two became friends as they shared an interest in early twentieth-century Austrian and German Expressionist art, which led to the establishment of the Neue Galerie in 2001 and its serving as a home to some of the most cherished Holocaust-reclaimed works of our time. Beginning with a welcome dinner on June 18, the Women’s Division Prime Minister’s Circle members were provided a talk by Chloé Valdary, pro-Israel writer and political activist who gained widespread attention for her outspoken support of the Jewish nation as a student at the University of New Orleans, where she became heavily involved in pro-Israel groups resisting anti-Semitism. Being a non-Jewish, young African-American woman, Chloé rapidly grew a reputation as a compelling voice in the world of Israel advocacy, forming her own Israel activism networks on campus and taking a stance against prominent individuals in the anti-Israel movement. Publishing articles in The Jewish Press, CAMERA on Campus, The Times of Israel, Israel National News and Wall Street Journal to name a few, Chloé discussed her current work at Jerusalem U, an Israel education organization where she serves as director of Partnerships and Outreach, where her main charge is connecting with millennials of all faiths and cultivating their affinity for Israel by using pop culture and social media as a conduit. The following day brought a series of uplifting events, starting with a private tour of the second floor of the Neue Galerie, which showcases fine and decorative art from early twentieth-century Austria, including paintings by Gustav Klimt, Oskar Kokoschka and Egon Schiele. Most notably on display is Austrian avant-garde artist Klimt’s Portrait of Adele Bloch-Bauer, a 1907 family heirloom which was looted by Nazis and finally recovered by its proper owner in 2006, as highlighted in the 2015 film Woman in Gold. Museum docent Carol Goldman underscored the history and significance of this masterpiece, reportedly the most expensive painting ever sold as of 2006, as well as each painting in the collection owned by Lauder. After viewing the exhibition, the Women’s Division Prime Minister’s Circle delegates assembled for a luncheon at Café Sabarsky, named for the late co-founder of the Neue Galerie. Laura Orzy, chairperson of Israel Bonds’ Women’s Division, remarked on the importance of continuing the fortification of the Jewish State through investments in Israel bonds, while Cathy Distelburger, chairperson of Israel Bonds’ Women’s Division Prime Ministers Circle, expressed her appreciation for the women in their supporting Israel’s economy and commitment to the nation’s future, then introduced the honorable guest speaker, Ronald S. Lauder. Growing up an assimilated Jew in New York, Lauder recalls his mother Estée dedicating her life not only to the cosmetics industry, but also to being a devout supporter of the Jewish nation. Receiving many Israel bonds for his bar mitzvah at her request, he recognizes their serving as a means to connect the modern Diaspora, to instill and strengthen one’s pride for their Judaism in addition to offering a meaningful return on investment. But it wasn’t until his appointment to the position of United States Ambassador to Austria by President Ronald Reagan in 1986 in which he felt deeply connected to his Jewish heritage, as he discovered that communities of Jews living in Central and Eastern Europe were far from thriving as they once were, before times of war and the atrocities of the Holocaust. Upon returning to New York in 1987, Lauder set out to change the face of Jewish education in these regions and established the Ronald S. Lauder Foundation, which, as of today, has instituted over 50 programs including Jewish schools, camps, community centers and synagogues in over 13 countries. 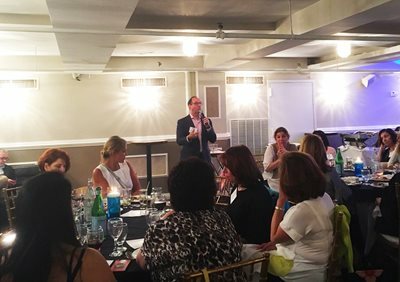 After an inspiring afternoon, the Israel Bonds’ Women’s Division Prime Minister’s Circle participants gathered for dinner and were joined by Tony Award-winning producer Seth Goldstein and his colleagues, Aaron Grunfeld and Sam Rudy, who provided an overview of the Broadway play Three Tall Women, which was ahead on the group’s agenda for the evening. Directed by Edward Albee, the play won the 1994 Pulitzer Prize for Drama, and most recently was revived on Broadway in March 2018 by director Joe Mantello, starring Glenda Jackson, Laurie Metcalf and Alison Pill. In a captivating reflection on the phases of a strong-willed nonagenarian woman’s life, the production provides an exposition of the high and low points of her existence, experiencing love and optimism as well as regret and sadness. 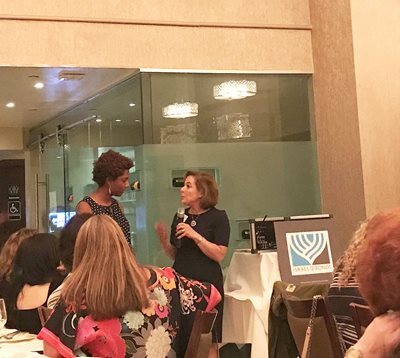 The goal of Israel Bonds’ Women’s Division is to encourage and empower women to stand as independent supporters of Israel by investing in the betterment and well-being of the Jewish nation on their own will, through events such as the Prime Minister’s Circle conference. Members are able to gain knowledge and confidence in knowing that their Israel bond investments will be utilized to create a stronger, more resilient nation for generations of the future. In total, the Israel Bonds’ Women’s Division Prime Minister’s Circle assembly generated over $2.6 million in Israel bond investments. In total, the Israel Bonds’ Women’s Division Prime Minister’s Circle assembly generated over $2.6 million in Israel bond investments.